Medtronic Perfusion Systems is a division of Medtronic CardioVascular and is comprised of over 3,000 committed and passionate employees worldwide who are dedicated to serving medical practitioners with perfusion and blood management solutions. We are constantly fulfilling our mission to alleviate pain, restore health and extend lives. Our products include the ACT Plus® System and the HMS Plus Hemostasis Management System. The ACT Plus® System combines a trusted standard in precise clot detection technology with state-of-the-art user features including data management and connectivity-ready capabilities. It is a microprocessor-controlled electromechanical coagulation instrument designed to determine coagulation endpoints in fresh and citrated whole blood samples. 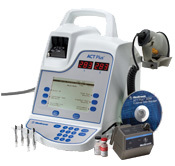 Clotting-time results are presented on the instrument’s Clot Time Display (CTD) and Liquid Crystal Display (LCD) screens. Duplicate channel testing, real-time clot detection, stores up to 1000 patient/QC records, stores up to 600 operator IDs, QC and User Lockout, optional barcode scanner, optional data management program. The HMS Plus Hemostasis Management System is a reliable and versatile platform used to perform multiple tests for heparin management. By providing information regarding the individual patient's response to heparin, the HMS Plus System determines the appropriate dose for the patient so that the needed anticoagulant and antithrombotic effect can be achieved. Determines patients individual response to heparin, Measures actual circulating heparin concentration, performs a duplicate channel ACT test, QC and User Lockout, optional barcode scanner, optional data management program.